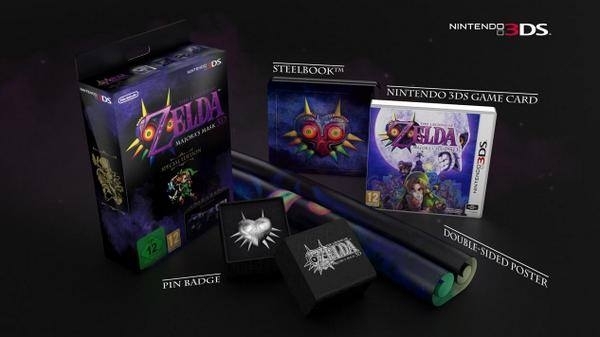 Today’s Nintendo Direct announced the highly anticipated future release of The Legend of Zelda: Majora’s Mask 3D, with the european livestream presenting us with a special edition version of the game. The large box features all kinds of goodies inside, including a Steelbook cover for the game itself, a pin shaped like the infamous mask and a double sided poster of which the details are foggy as of yet. The pin will come in a fancy, dedicated box wielding the title screen logo, one side of the poster will most likely feature the mask itself as what seems to be an eye is visible, while the other side hints a flash of green, the steelbook will show off the mask as well, and the box which serves the purpose of holding all these items looks gorgeous, as it features the title and young link in front of an extremely atmospheric backdrop. For more information regarding Majora’s Mask 3D, stay right here at Zelda Informer!